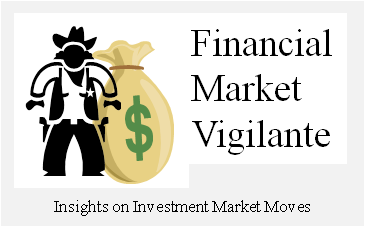 Financial Market Vigilante: Should Investors Chase the Current Stock Market Rally? 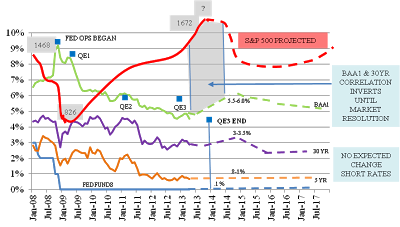 Now take a share of the S&P500 and analyze the returns over the same period of time. As the graphic shows the CAGR of the stock market over that period of time was 16.5%. The capital appreciation of the perpetual bond over the same period was 15.04%. When the lower dividends are balanced against the higher interest payments on the bond, both investments have doubled in value since January 2009. Historically, although the Fed operations began in September of 2008 with the massive $1.2T open market purchases after the Lehman Brothers bankruptcy, true quantitative easing in which the Fed began to increase holdings of U.S. Treasuries to influence the overall term structure of interest rates began in January 2009. I point this out because future performance of the equity market will have to be driven by real growth and interest rate changes, while bond-like securities will only get the interest rate driven returns. If you believe the Fed can lower rates even further, the correlation in the bond market and the stock market will continue. However, there is going to be a divergence at some point, and it appeared to begin as we entered May 2013 when the term structure of interest rates began to tick up. At this stage, for stocks to outperform, they need to show marked improvement in nominal growth, much stronger than the past 4 years, not just Fed induced interest rate driven changes in valuation. Look for the stock market to continue to push upward in anticipation of the Fed withdrawal of accommodation. The question will then become, is this market move sustainable? Currently a large number of investment advisers are recommending that the place to be as this divergence progresses is stocks. Typically that is sound advice, if you lived in inflationary times. But we are in a period of wage deflation and low to negative job growth. So I currently have contrary advice – for a very simple reason. The share price of the U.S. stock market as measured by the S&P500 is already overpriced, and will get more so as QE3 progresses through 2013. Any run-up in value from the current level will terminate in a correction. You will need to be very quick to judge the timing on when to exit this trade. So the best strategy now that you already have a 17% return so far in 2013 is to steadily redeploy gains into investments that are not correlated to the aggregate stock market, or to longer term bonds, and begin holding more of the most non-correlated asset - cash. The correction I forecast in the S&P will be driven by continued low growth and the disproportionate increase in stock prices relative to economic output. I expect a market spike in corporate BAA1 rates and even worse in the junk bond market rates. However, I do not expect the BAA1 re-alignment to higher rates to be permanent, just as it was not in 2008 – and it will not be as serious because the mortgage market is currently much more controlled. As the correction approaches and the sell-off progresses, the bond market should be a buy again. This forecast is back up by research published in the article: 6 Fed Tightening Points in History Examined What Happened? But no matter what happens in the stock market in the next year, my view is that the Fed will continue its “extended period” of low rates policy for Treasury securities, and the very short end of the Treasury curve will not change dramatically. This is more politically than market driven, and any risk-off correction in the market will just be an excuse to extend the policy even longer. (I explain this position in more detail in the article How and Why Zero Rates Ended Last Time). If you plow more money into the stock market on the margin, as many will as the momentum builds, be careful out there…and make sure you have a seat when the music stops.